When America entered WWI on April 6, 2017, a number of government agencies were created to oversee various aspects of the war effort. Some of these focused on the homefront. Agricultural production was a chief concern, essential for sustaining the country during wartime. And so the Women’s Land Army was created. Women had already been recruited for agricultural work in other nations participating in the way as farmers went off to fight. Although some farmers and government officials opposed bringing women in as farmworkers, the program was successfully carried out. Beginning in the summer of 1917, women were broken up into units, trained in agricultural skills, and sent out in groups to work on farms. Experimental techniques were tried, as well as more traditional farming. By the summer of 1918, the Women’s Land Army had been fully incorporated, and trained squads of women were being deployed to assist with farming across America. 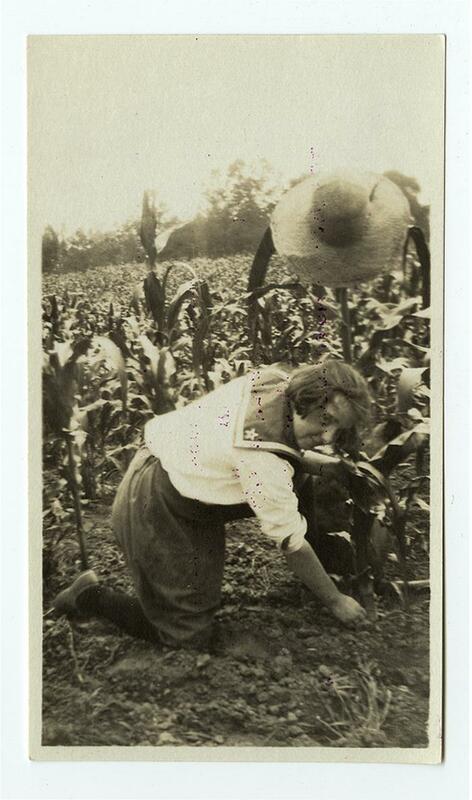 The story of the Women’s Land Army didn’t end with the Armistice. Food shortages following the war meant that the United States had to maintain a high level of production. The nation ultimately sent twenty million tons of food to famine-stricken Central and Southern Europe. 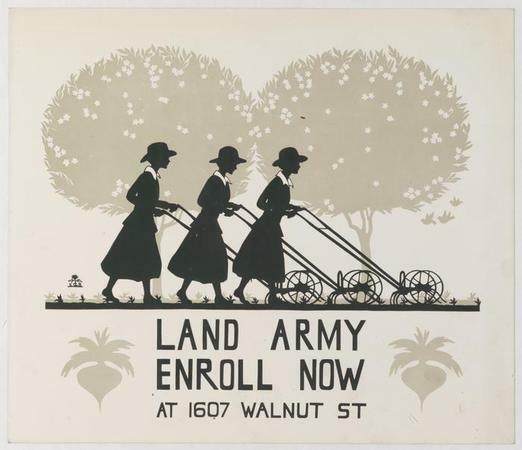 The Women’s Land Army was moved to the Department of Labor in 1919, in part to reflect that many of the women serving had come from urban areas. The Land Army, with its pay of $2 a day, was an opportunity for employment. However, as soldiers were demobilized and returned home, the need for laborers from the Women’s Land Army rapidly decreased. By 1920, many women had returned home, themselves demobilized. In January of 1920, the national leaders of the Women’s Land Army decided to dissolve it entirely. Although it only existed for 18 months the Women’s Land Army trained and placed over 20,000 women in committees, training camps, and farms across America. In Philadelphia, women interested in joining the WLA could enroll at 1607 Walnut Street. HSP’s collection includes a simple poster advertising the location – including an image of three women decidedly not in the WLA uniform. Several photographs from the Philadelphia War Photograph Committee Collection [V03] show members marching in a parade and working on a farm. Other evidence of the WLA in Philadelphia appears in the Garden Club of Philadelphia records, which was active in the WLA and in agricultural reconstruction in France. Although not yet digitized, these papers are available for research at HSP!